In addition to online banking, State Bank also offers a convenient BillPayer product as well. When you sign up for BillPayer, you can pay virtually all bills online ... it's fast and easy, affordable and safe! Plus, all bills paid online will be reflected in your account history, making it a snap to keep track of. Eliminate writing checks, licking envelopes and buying stamps ... sign up for BillPayer at your nearest State Bank location today! Popmoney® is a powerful new service that lets you "Pay Other People" (POP) anywhere, anytime using only their email address, mobile phone number, or bank account number. So whether you're sending a last minute gift or splitting the cost of concert or event tickets with friends, you can do it without writing a check or going to an ATM. Best of all, you don't need another account. You can simply use your existing State Bank checking and Internet Banking with Bill Payment account. 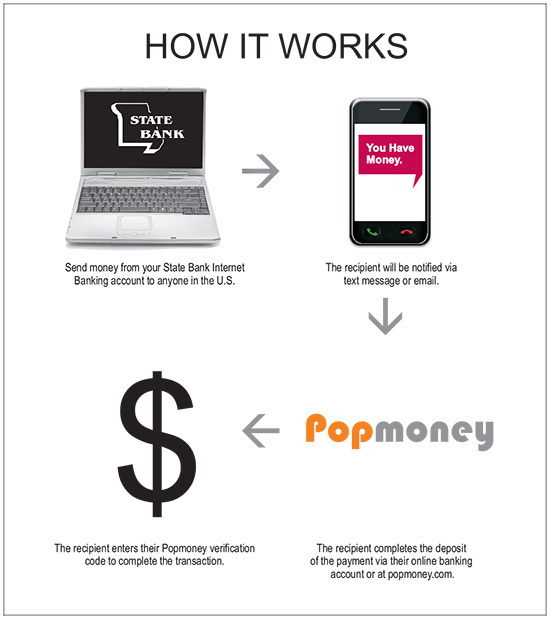 Popmoney is a secure way to send or receive payments using an individual’s email address or mobile phone number. Enter the mobile phone number or email address of the payment recipient, payment amount and a personalized message (optional). A text or email is sent to the recipient letting them know they have a payment waiting. A message is also sent to you to confirm your payment. Note: A small fee is assessed per transfer (paid by the sender).The recipient receives the full amount of the transfer. This service allows you to send money to anyone, regardless of where they bank. How Do I Receive Money Into my State Bank Account? There is no charge to receive money and payments are transferred to your account in as little as one day. If the sender sends the payment to your mobile number or email address, you’ll need to log into State Bank Internet Banking with Bill Payment account and direct the payment to your account via Popmoney tab. If the payment includes your account and routing number, the payment will automatically be directed into your account. Are there any fees to send a Popmoney payment? It costs $0.55 to send a Popmoney payment, similar to the cost of a postage stamp but much faster than standard mail. To send Popmoney payments, you must also be enrolled in State Bank Internet Banking and register for Bill Payment. Our Bill Payment service is free when you pay at least three bills each month. There is a fee of $5.50 per month if less than three bills are paid.